In these harsh and unforgiving times of cynical post-postmodernity and 21st century fatalism, you might be forgiven for wanting to bury your head in the sand – or at the very least barricade yourself indoors… after all, it is a mad mad mad mad world out there. But fear not, o faithful reader, for when better a time than now to lock yourself away and begin work on your very own hi-tech digital audio recording studio? Yes, the modern world may seem a vast and confusing place, but at least the advent of quality, affordable home music production has finally arrived! This series of articles will be offering you advice on all aspects of putting your studio together – from component selection to recording your first song – but lets not get too far ahead of ourselves just yet. Ok, so unless you have tons of money stashed under the floorboards or some other significant source of cash, the importance of the first point should be obvious – set a budget and stick to it: don’t overspend if you have little money to spare unless you enjoy living off beans on toast!! You will essentially build your studio piece by piece, over a number of years if necessary. WHO will be using the equipment – are you in a band, or are you a solo singer/songwriter with demos to record, or maybe a bedroom DJ trying to record your mixes? Plan your studio accordingly – an orchestra can’t do much with a little 2-bus mixer, likewise a 48 channel mixing desk would be lost on a solo acoustic artist. HOW will you have your studio set up? Who is using the equipment will largely determine how it is used – but also more generally what is used. Your computer. This is obviously not the only way you can record music, but it is one of the most popular and affordable ways and it is for that reason the method we will be focusing on in this series. The ideal is that you have a dedicated computer (or a few if you’re lucky) that will deal with all of your recording and editing software without having any of the clutter of your home PC (we will get to the importance of a clutter-free desktop in part ii) – the ideal, he says. I understand many people will be hesitant to get another computer or laptop just for their music, so don’t worry – it’s not essential, but it is something you will want to think about doing in the future. Remember – piece by piece! The instrument: this is the cause of the sound – voice, speaker, string etc. Remember – this doesn’t have to be external to your computer, many synth instruments can be controlled directly from the software on your PC (thus skipping out numbers 2 – 4). The mixer: this is where the sound (signal) is processed. Most mixers will have a pre-amp built in, and all should have volume and stereo faders to mix the channels. 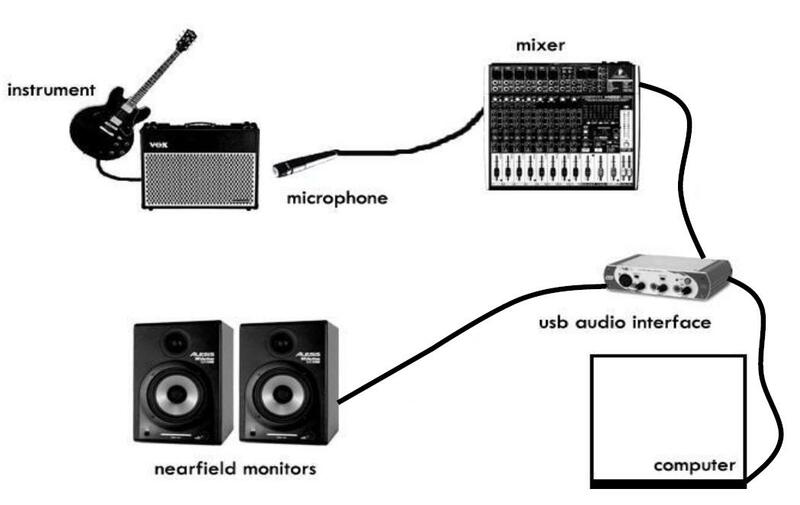 The USB audio interface: this is the mediator between your live gear (i.e. your amps, mics, mixer etc) and your studio-brain/computer. The interface allows the signal to travel into the computer and to the audio software of your choice, where it can be saved in superbly high quality on your hard-drive. The computer. Once saved you can use your computer to do whatever you like with your recording – and I mean that literally: the only limit in sound recording is your own imagination! Finally, you can also use your computer to master and then burn your tracks to CD and make some neat artwork. The monitors: the monitors shown in the example are near-field monitor speakers, which means that they are designed to be listened to at fairly close proximity, i.e. from across a desk in a studio. Studio monitors are designed to give a ‘flat’ frequency response – this is to give you an accurate, uncoloured or ‘transparent’ reproduction of the source audio. If you are just starting out, please don’t wet your pants when you see the price of a pair of these things – for now you can get by for just so long using an intermediary pair of PC speakers, but please promise me that you will get a decent pair of monitors soon! Come back soon for part ii, where we will be looking much closer at the components involved and at the different ways you can record your music. This entry was posted in Music, Series, Studio, Tutorial and tagged Audio, Home, How To, Music, PC, Recording, Sound, Studio, Tutorial. Bookmark the permalink. Awesome articles on your site! Bullets are a bit big though, eh? hey, thanks! yeah, i don’t get it – it seems to look fine on firefox, with nice small bullets. but on internet explorer they’re monsters! tried asking a few people on the support boards, but no one seemed to have a clue lol. what happened to parts 2, 3 etc?